The XWallet which is our digital asset payment app has recently surpassed 100,000 registered users! This is just three months after it was made available for users to connect their regular digital asset wallets to the Pundi X crypto-payment ecosystem. 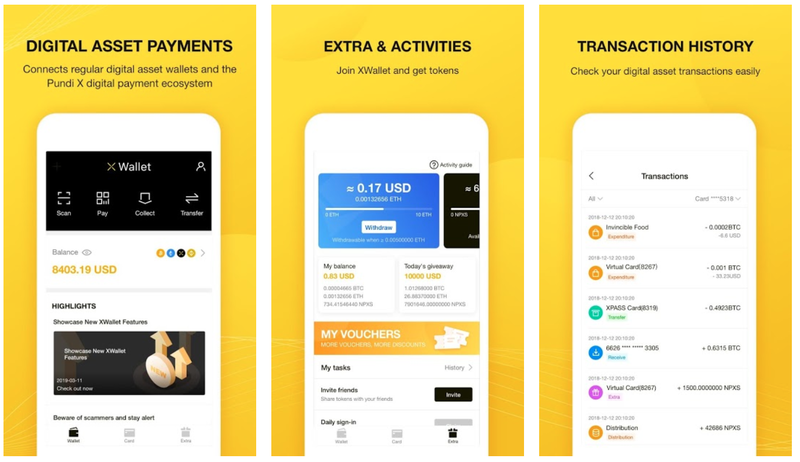 The XWallet mobile app connects regular digital asset wallets with the Pundi X blockchain-based payment ecosystem. Through the XWallet, one can easily manage digital assets stored in the physical XPASS cards, check current balances, top-up major cryptocurrencies or conduct crypto payment transaction instantly at physical stores. By default, the XWallet comes with a virtual XPASS card in the app for each of its registered user. Users can top up and pay with major cryptos, including BTC, ETH, BNB and NPXS, and whereby one can transact or purchase goods and services from physical stores, with the XPOS already activated in over 250 retail outlets and verified XWallet merchants across 30 countries in the world. Any Pundi XPASS card holder is able to pair his or her card with the XWallet to have the flexibility to make payments directly from the app without the physical XPASS card. The other benefit of pairing the XPASS card with the XWallet is the ability to control and move the digital assets within the XPASS card virtually in the event the physical XPASS card goes missing or misplaced. “It’s ultimately about versatility and security — transactions via an internet-connected XWallet app or the offline physical XPASS cards can be processed immediately. Merchants have the option to print out their QR code found in the “Collect” feature in the XWallet and use it an offline setting without the need for an online connection. All the offline transactions can still be made by scanning the QR code, which will later be uploaded onto the blockchain,” added Cheah. We are pleased to share that our 100,000 XWallet users come from every corner of the world and not just limited to a specific country or region. 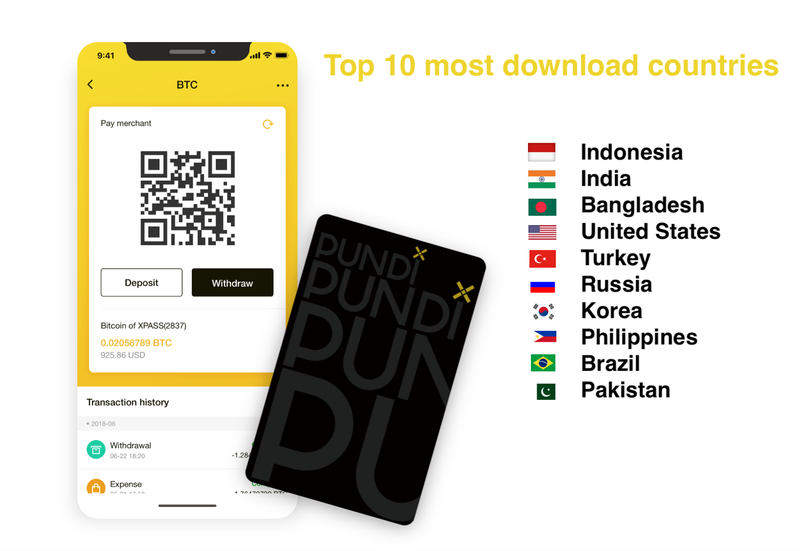 The ten countries with the most XWallet users include India, Bangladesh and Pakistan in South Asia; Philippines and Indonesia in Southeast Asia; Korea in East Asia; Turkey in West Asia and Eastern Europe; Brazil in Latin America; the United States; and Russia. The countries with the most active XWallet users almost mirror the “Top 10 most download countries” list with Indonesia, India, and the United States claiming the top three places. The Philippines and Brazil fall out of the “Top 10 most active XWallet users” list with Spain and the United Kingdom replacing them. In short, the XWallet’s geographic footprint is truly global. We perceive the typical XWallet user to be a global citizen who wants to experience the latest innovations in blockchain technology and mobile crypto payment. We are currently testing out a new SMS service as some users in India, Nigeria, Russia, Turkey, Belarus and Mexico have previously experienced issues of receiving SMS. The latest version of XWallet is already been equipped with an improved SMS delivery service. And that is applicable for “new account registration with phone number” and ‘withdrawal’ for existing members who have already added their phone numbers. We are testing the new SMS delivery service and once it’s optimized, we will expand it to users who want to ‘add new number’. To enhance the security for the XWallet users, the team is also working on a 2FA implementation. We have already implemented OTP (One Time Passcode) via both email and SMS delivery. Users will have added security with the introduction of 2FA which will be ready in the coming weeks. Last but not least, we will continue to bring more features to the XWallet in the near future. Now we are in the work to integrate more tokens with partners that can be utilized across the Pundi X payment ecosystem. Also, to path our way toward decentralization, the Function X testnet will be available within the XWallet app. Thus, XWallet users will be able to have a glimpse of what the Function X blockchain and its ecosystem will be. As always, we want to thank you for all your support and feedback. Stay tuned for more exciting news and updates!